Nearly 3% of Finnish women used or initiated estrogen use after Alzheimer’s disease (AD) diagnosis. The prevalence and incidence of estrogen use were similar in comparison to a matched cohort without AD. Altogether 3.7% of users with AD and 2.3% without AD continued estrogen use until death. According to the 2017 statement by the North American Menopause Society (NAMS), hormone therapy is “the most effective treatment for vasomotor symptoms and genitourinary syndrome of menopause” . The recent Cochrane reviews [2, 3] reported that hormone therapy has little or no benefits on cardiovascular disease, but it increases the risk of several adverse outcomes, including breast cancer, stroke, dementia and venous thromboembolic events. For estrogen-only therapy, fractures are the only outcome with strong evidence for benefits [2, 3]. Although individual studies have shown that hormone therapy has a beneficial impact on mood , and the impact on cognition may be dependent on the type of hormone therapy and age of initiation [4, 5, 6], the NAMS states that in the absence of more definitive findings, hormone therapy cannot be recommended at any age to prevent or treat cognitive decline or dementia . The current global consensus statement on menopausal hormone therapy recommends initiation before age 60 years or within 10 years after menopause, but does not provide any guidelines on discontinuation . The 2017 NAMS statement, endorsed and supported by several gynecological and menopause societies worldwide, recommends individualization of hormone therapy, with shared decision making and periodic reevaluation of the risk–benefit profile . According to that statement, benefits are most likely to outweigh the risks for those women with postmenopausal symptoms who are 50–59 years old, initiate the treatment within 10 years of menopause onset and have no contraindications, whereas the risks of initiation appear greater for women aged 60 years and over, or women who are further than 10 years from menopause onset. The risks are particularly increased for those aged 70 years and older or who are more than 20 years from menopause onset . Although national studies from the USA showed that the decline in self-reported estrogen use in 1999–2010 was evident across a variety of population subgroups, including different age and ethnic groups [8, 9], it is unknown whether cognitive status or diagnosed cognitive decline affects estrogen use, even though estrogen users had higher dementia incidence in some randomized controlled trials [2, 3]. We assessed how common systemic estrogen use was among Finnish community-dwellers with incident Alzheimer’s disease (AD), whether the prevalence was comparable to women without AD, and the continuation of estrogen use after the AD diagnosis. The Medication and Alzheimer’s Disease (MEDALZ) cohort includes all community-dwellers in Finland who received a clinically verified diagnosis of AD in 2005–2011 (N = 70,718), described in more detail in Tolppanen et al. . Briefly, persons with AD were identified from the Finnish Special Reimbursement Register maintained by the Social Insurance Institution of Finland. The diagnosis was mainly based on the National Institute of Neurological and Communicative Disorders and Stroke and the Alzheimer’s Disease and Related Disorders Association (NINCDS–ADRDA) and Diagnostic and Statistical Manual of Mental Disorders, 4th edition (DSM-IV) criteria for AD [11, 12], and it included (1) symptoms consistent with mild or moderate AD, (2) nontransient decrease in social capacity, (3) computed tomography/magnetic resonance imaging scan, (4) exclusion of possible alternative diagnoses, and (5) confirmation of the diagnosis by a registered geriatrician or neurologist. Women (N = 46,116) of the MEDALZ cohort were included. An age- and region-matched cohort of women without AD was identified for comparison purposes. Data on dispensed medications in 1995–2012 were extracted from the Finnish National Prescription Register, which covers reimbursed prescription purchases, with the exception of those provided in hospitals and public nursing homes. Medications are categorized according to the World Health Organization’s Anatomical Therapeutic Chemical (ATC) Classification system, and purchased amounts are recorded in defined daily doses . Systemic (i.e., oral or transdermal) estrogen use was identified with the following ATC codes: G03C (estrogen) and G03F (estrogen and progestogen in combination), based on package-level data on drug formulation. Use of combination products was then recoded to use of estrogen, and after this, total time on estrogen was modelled with the validated Prescription Drug Purchases to Drug Use Periods (PRE2DUP) method [14, 15]. In Finland, only estradiol valerate and 17-beta-estradiol are used. Conjugated equine estrogens are not available. Personal identity codes were used to compile the research database from various national registers, as described previously . All data were de-identified by the register maintainers, and ethics committee approval and informed consent were not required (de-identified data were used and the study participants were not contacted). Statistical analyses were performed with Stata/MP 14.1 (StataCorp LP, College Station, TX, USA). Estrogen use (obtained either from estrogen or combination products) was categorized as none, only before the index date, before and after the index date, and after the index date only. Index date refers to the date of AD diagnosis, which was the matching date for the comparison person. Thus, the follow-up of each matched AD–no-AD pair began on the date of AD diagnosis of the AD case. The follow-up ended on 31 December 2012 (end of data linkage), date of death, end date of last estrogen use period or institutionalization or > 90 days hospitalization, whichever occurred first. We present the data for estrogen use in general (regardless of whether the women used estrogen or combination products) and report the number of women who used combination therapy. Time to discontinuation after the index date was calculated as the difference between the last use date and the beginning of the follow-up period (prevalent users, i.e., those who had initiated the use before the beginning of the follow-up period) or between the last use date and the first use date (incident users, i.e., those who initiated during the follow-up period). Data are presented as number (percentage) for categorical variables and mean [95% confidence interval (CI)] for normally distributed variables, and median (95% CI) for variables with skewed distribution. In the main analyses, the entire AD cohort was compared to the non-AD cohort. Sensitivity analyses according to the age at AD diagnosis (35–54.9 years, 55–64.9 years and 65–105 years) were conducted. Temporal changes in the prevalence of estrogen use 1 year after AD diagnosis were investigated with logistic regression including year of AD diagnosis and age as predictors. The data are presented as risk ratios (RRs), with RRs below 1 indicating estrogen use being less common in persons diagnosed with AD/beginning the follow-up in that specific year in comparison to those diagnosed with AD/beginning the follow-up in 2005. The average age of women at the beginning of the follow-up period was 80.8 years (range 34.5–104.6). For the majority (86.2% with AD and 86.4% without AD), systemic estrogen purchases after 1995 were not identified from the prescription register (Table 1). Approximately 10% of women with and without AD had discontinued systemic estrogen use before the follow-up period, while 3.1% of women with AD and 4.3% without AD had used estrogen during the follow-up period. Less than 0.5% initiated estrogen use during the follow-up period. Less than 3% of women used combination therapy. The average age of users was 74 years in both cohorts. The majority of users (71.5% and 59.1% with and without AD, respectively) discontinued estrogen use before death or long-term hospitalization/institutionalization, but 3.7% of users with AD and 2.3% without AD continued estrogen use until death. However, nearly one fifth of users with AD (17.9%) and 37.1% of those without AD continued use until the end of the follow-up period, meaning that the average use duration is an underestimation of the true use. The median time to discontinuation or end of follow-up period after the index date was 1.3 years among those with AD and 2.4 years among those without AD (Table 1, Fig. 1), with shorter median times observed among those who initiated after the index date. 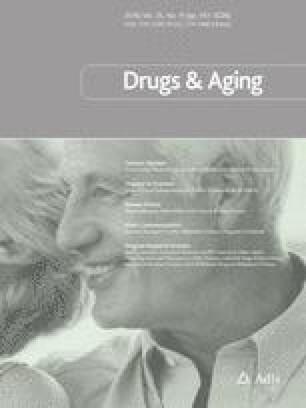 The average estrogen use time decreased across age groups, but this was more evident among those with AD. There were no clinically meaningful differences in the types or administration of estrogen-containing products between those with and without AD (Table 2). When the data were stratified according to the age at AD diagnosis (or the beginning of the follow-up for the comparison cohort) (Table 3), the proportion of estrogen users initiating during the follow-up period was the highest in the youngest age group (4.3% and 8.0% in persons with and without AD, respectively) and declined to 0.3% in the oldest age group. Use of combination products was the most common in the middle group (age 55–64.9 years, with 11.1% of women with AD and 14.5% without AD using before and after the follow-up period). The average duration of estrogen use during the follow-up period declined from 3.34 to 1.96 years across age groups for those with AD, and a less evident decrease was observed for those without AD. However, in the oldest age group, the follow-up period was more commonly ended because of end of data linkage than in the younger age groups. The prevalence of estrogen use 1 year after AD diagnosis declined in 2005–2011 (Table 4). The slope was similar in persons with and without AD and accross age groups (data not shown). According to our findings, the use of systemic estrogen was rare after AD diagnosis. However, although the rationale for systemic postmenopausal estrogen use in advanced age is questionable [1, 3, 7, 16], approximately 3% of Finnish women who were community-dwelling at the time of AD diagnosis either used estrogen or initiated estrogen use after AD diagnosis. Altogether 3.7% of users with AD and 2.3% without AD continued estrogen use until death, and the follow-up period ended at the end of register linkage for 17.9% of users with AD. Thus, it is likely that a larger fraction continued to use estrogen until death. The prevalence, incidence and types of products used were similar in comparison to a matched cohort without AD. Similar to previous US studies based on self-reported data, we observed a decline in systemic estrogen use in 2005–2011 [8, 9]. Strengths of our study include the nationwide cohort of persons with clinically verified AD diagnosis. However, as the sample was restricted to those who were community-dwelling at the beginning of the follow-up period, the results are not generalizable to institutionalized persons. This restriction was applied because medications provided at certain institutions and in all hospitals are not recorded in the prescription register and thus inclusion of institutionalized persons would have increased the possibility of misclassification bias. For the same reason, the follow-up was discontinued at long-term hospitalization or institutionalization. The hormone therapy purchase data were obtained from national registers, which include all purchased reimbursable medications. Although purchased medications may not always reflect consumed medications, our results are not prone to recall bias, and the dispensing data approximated the medication use better than prescription data . One limitation of our study is the lack of data on age at menopause, but as the mean age at AD diagnosis was 80 years, it is likely that the women were mainly menopausal on the index date. The current evidence on harms and benefits of estrogen treatment does not support, but rather discourages, its use among postmenopausal women. Although estrogen use has been suggested to be beneficial for bone health  , improved mood , and, depending on the time window, for cardiovascular diseases , it has also been related to a higher risk of cerebrovascular events, cancers and adverse cognitive outcomes among postmenopausal women [1, 2, 3, 7, 16]. Further, although estrogen helps to maintain the bone mineral density, this declines rapidly after estrogen discontinuation . Recent Cochrane reviews do not recommend its use for preventing cognitive decline or dementia or cardiovascular diseases, but rather raise concerns about an increased risk of adverse events [2, 3]. The current global consensus statement on menopausal estrogen use recommends initiation within a certain timeframe, but does not advise on how long the treatment should be continued . Postmenopausal symptoms can continue for over 10 years for some women, and it has been suggested that these women should first undergo trials of nonhormonal options, and return to estrogen if these alternatives do not have beneficial impact . The 2017 NAMS statement recommends an individualized approach, and underlines the importance of shared and, more importantly, informed decision-making, with periodic evaluation of risks and benefits . The rarity of systemic estrogen use after AD diagnosis in our data is in accordance with the current evidence. The proportion of new users, i.e., those who initiated during the follow-up period (which commenced on the AD diagnosis date of the index person) was highest in the youngest age group (age < 55 years at the beginning of the follow-up period) and only a small proportion (less than 0.5%) of women who were 65 or older at the beginning of follow-up initiated hormone therapy during the follow-up period. This decline of initiations across age groups is in line with the current NAMS statement on the most favorable risk–benefit ratio among younger women . As postmenopausal use of systemic hormone therapy has been shown to have adverse consequences on cognition and the evidence on its risk–benefit profile does not support long-term postmenopausal use in general , the fact that (1) some persons initiated estrogen use after AD diagnosis and (2) some continued estrogen use after AD diagnosis or until death may not be consistent with evidence-based medicine or rational prescribing. However, it should be noted that an individualized approach for hormone therapy is recommended . Although the average use duration was below 10 years in our study, it should also be noted that the use period ended often due to the end of data linkage and thus the duration of use in our study was underestimated, especially in the oldest age group. However, this does not affect the prevalence and incidence estimates. In conclusion, there were no major differences in systemic estrogen use among Finnish women with AD when compared to those without AD. The observed use patterns were mainly consistent with the current recommendations. Anna-Maija Tolppanen is funded by Academy of Finland (Grants 307232 and 295334). Heidi Taipale and Anna-Maija Tolppanen acknowledge funding from the University of Eastern Finland, which also paid for Piia Lavikainen’s salary. The funders played no role in the design, methods, data collection, analysis and preparation of the article or the decision to submit the article for publication. Anna-Maija Tolppanen, Miia Tiihonen, Heidi Taipale, Marjaana Koponen, Antti Tanskanen, Piia Lavikainen, Jari Tiihonen and Sirpa Hartikainen declare that they have no conflicts of interest relevant to the content of this study. WHO Collaborating Centre for Drug Statistics Methodology. Guidelines for ATC classification and DDD assignment 2012. In: 2011. http://www.whocc.no/atc_ddd_publications/guidelines/. Accessed 15 Mar 2012.